In an effort to incorporate “sustainable” lifestyle practices in the home, and work towards a greener environment for generations to come, many homeowners have turned to energy efficient lighting. Replacement of incandescent light bulbs is fast becoming a reality, and light-emitting diode or LED technology, is leading the way. But with all the existing light bulbs that are out there, and with demand for lighting increasing every year, what do we do with expired LED bulbs? Is there a service as effective as data destruction, ITAD renewal, and other forms of e-waste electronics recycling ? The good news is that recycling LED lights is now available, and it’s a great idea to do it. But as with all good things, there is a hidden price, so here’s what you need to know about led bulb disposal and LEDs to make the best decision for your new home lighting. With an average life of nearly 50 times greater than an incandescent light bulb, and lasting even 6 times longer than that of its compact fluorescent bulb (CFL) counterpart, LED light bulbs seem like a great option to reduce your energy usage around the home. And it’s true. 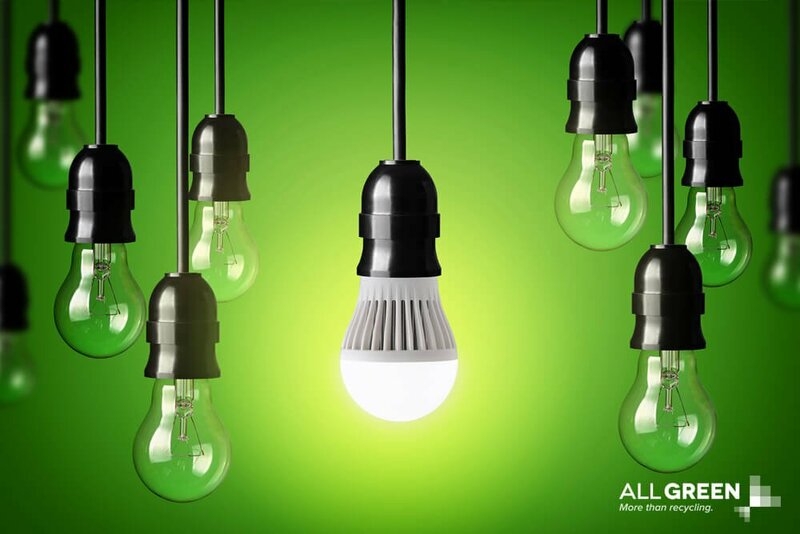 LED bulbs use up to 80% less energy than incandescent bulbs, so the energy savings are significant. It’s no wonder the popularity of LEDs is skyrocketing. On top of these energy efficiency gains, LEDs are more durable, contain no mercury (unlike CFL bulbs) and produce almost no heat. This makes the LED light bulb a great choice for your home. But despite the long-life advantage that LEDs offer, the time will come when you need a responsible way to recycle or repurpose these bulbs. Can led light bulbs be recycled? Yes, LEDs are an environmentally friendly lighting solution to use around your home, but what about when they eventually hit the lighting grave? Although LEDs don’t contain mercury, they are still known to contain significant levels of lead, nickel, arsenic and copper. In high quantities of exposure, these metals can prove harmful to humans, so proper disposal and recycling is much preferred option over landfill. The good news is that, like hard drives for computers, LEDs are RoHS compliant, meaning that they can be disposed of and recycled like an ordinary incandescent light bulb. Recycling and proper disposal of led bulbs is, of course, a better option for the environment. So rather than sending more waste to our growing landfills, consider recycling options that make your contribution to the global sustainability effort even easier. How to dispose of led bulbs? When it comes to recycling your expired LED light bulbs, there are a number of options available. You can contact one of the thousands of local recycling centres across the country to enquire about recycling your LEDs there. With the increased consumption of LED lights, many of these recycling centres have developed LED-recycling programmes that reuse the valuable materials in the bulbs. Try a quick search online for information including specific recycling details or guidelines. An even easier, more convenient option is to find a recycling depot that will take your burned out LED bulbs via mail, so you don’t even have to go to a recycling depot. It’s possible to ship them to online recycling programmes that do all the work for you at little to no cost to you. It’s becoming more common for retailers to participate in recycling programmes, and LED recycling is now part of this trend. Some stores have bins designed for collection of used bulbs, and some car parks even have industrial scale recycling units, similar to clothing donation bins. For many years large retail giants such as IKEA and Walmart have been leading the way with in-store recycling, and many supermarkets have decided to get on board to offer recycling bins as well. Recycling LED light bulbs is a great way to reduce your environmental impact, and ensure that you’re playing your part in preserving an environment that can be enjoyed by future generations. If you didn’t know about LED recycling before, it’s not as hard as you might have thought. And as LEDs become more popular, recycling options will become even easier and more available.